Happy Pi Day! When I was in high school there was this great teacher who always went all out with his students and everyone was jealous that they got extra credit for bringing in pie and having fun (especially those of us with the evil math teacher, Mr. P). They even had a chant to help rattle off the numbers. 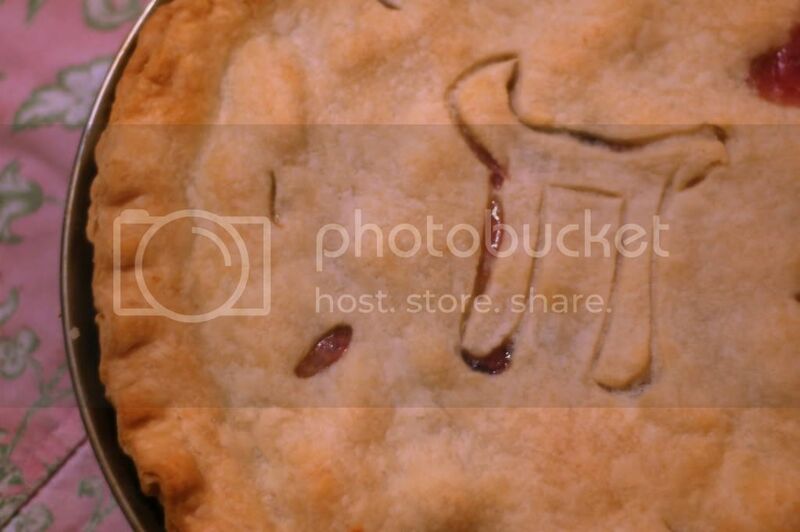 I guess you could say I'm living out some sort of childhood fantasy by celebrating Pi day but really I'm trying to blog more consistently and figured it was a good excuse to make a pie- one of my favorite things to do. I know a lot of people stress over crust and filling but it's important to remember what the Barefoot Contessa would say- butter, sugar, flour, how bad can that be? Most pies turn out delicious even if they aren't beautiful. This pie, inspired by the Pear Lattice Pie from a cookbook I picked up at Goodwill recently- the Best of Gourmet- a Year of Celebrations. It's a beautiful book and super cheap on Amazon. I had to buy it since I couldn't stop looking at all the gorgeous photos! This is the first recipe I've tried so far and it was easy and delicious... minus one hiccup. I forgot to mention that I decided last minute to make a pie yesterday- after a long day of Church meetings, Church, and a screaming Baby Strawberry. Making pie is therapeutic though and I figured it would add a lot to dinner so I made up the pastry quickly in the food processor and stashed it in the freezer to cool as quickly as possible (you can make the crust by hand but it's quick and easy to use the FP, I recommend a Cuisinart like one of these). Then I set about making the filling- I peeled four nice pears, added a little basket of blueberries for color, the flour, salt, cinnamon, and nutmeg. A squeeze of lemon juice and it still seemed awfully dry to me. So I added some more juice (and zest while I was at it). Still dry. I usually work with apples instead of pears so I figured something just must be different there, so I set it aside and went to work rolling out the crust. After I baked the pie, everyone was clamoring for a slice so we didn't even let it cool properly. My tall man happily tasted it for me and suddenly I realized what was wrong with the filling- I'd left out the sugar! Oh man, I was so mad that my crazy day had compromised my beautiful pie! Like I said, though, you can't go too wrong (despite my sugarless pie with loads of extra tart lemon juice!) I served the pie with generous dollops of *heavily sugared* whipped cream and it was enjoyed by all. Of course in all the flurry trying to fix my pie I didn't get a picture of a slice with all the pretty fruit filling. Nonetheless, I hope you'll consider making a pie. You can see some of my favorites here. Even if you use store bought crust and just press it together with the tines of a fork, I really feel like pie is the kind of dessert that brings people together and makes them feel loved- even if you forget the sugar. And that's what it's all about! Today I also have a great giveaway from Yoplait via MyBlogSpark. We aren't big milk drinkers over here so in order to get enough calcium we serve a lot of Yoplait (my favorite is the key lime pie, wow). These parfaits come in all sorts of great dessert flavors like chocolate raspberry and lemon torte. MyBlogSpark sent us a prize pack and my little man LOVED this stuff. I loved that I didn't feel guilty giving it to him! The prize pack includes a coupon to try Yoplait Delights, a Chocolate scented votive candle, insulated tote and aromatherapy eye pillow- all together a nice package to help you relax and enjoy yourself (much needed after a long day and a sugar less pie, right?) You can even print out a coupon here. I have one prize pack to giveaway- to enter just leave a comment and if you'd like to indulge me, do tell the craziest things you've done in the kitchen so I'll feel better about the pie! You can have an extra entry by becoming a follower and leaving me a separate comment to let me know. I'll leave the giveaway open until Friday at midnight (AZ time). Hopefully I'm not the only one to make silly mistakes in the kitchen! Blend together flour, butter, shortening, and salt in a bowl with your fingertips or a pastry blender (or pulse in a food processor) until most of mixture resembles coarse meal with some small (roughly pea-size) butter lumps. Drizzle evenly with 5 tablespoons ice water and gently stir with a fork (or pulse in food processor) until incorporated. Turn mixture out onto a work surface and divide into 8 portions. With heel of your hand, smear each portion once or twice in a forward motion to help distribute fat. Gather dough together with scraper and press into 2 balls, then flatten each into a 5-inch disk. Wrap disks separately in plastic wrap and chill until firm, at least 1 hour. e to the x dx dy! e to the y dy dz! We had pi day today at work -- cherry and apple. I can't wait to try this recipe. Happy Pie Day! The first time I made English toffee, I couldn't figure out why it wasn't turning that nice penny color...until I realized that when making candy you really do have to care about butter vrs margarine! oops! Here's to Anne - the best cook ever!!! Craziest thing was peanut butter chicken. It was on a lid of natural pb so what was I thinking. Let's just say it was a one time making recipe.